For the past 12 years, phones have grown larger, added a ridiculous number of cameras and offered ever more screen space. But, somewhat boringly, they’ve remained basically the same since the original iPhone. Thankfully, this has all changed for 2019 with the announcement of several foldable phones, whose bendy displays open out to turn them into tablet-sized devices. These properly new phones were undoubtedly the stars of the show at this year’s Mobile World Congress, but at around £2000 each they’re also ridiculously expensive. Luckily there were still loads of fantastic traditional phones unveiled that will be here in a matter of weeks. We swiped, stroked and selfied with them all in Barcelona to help you decide which one deserves a place in your pocket. 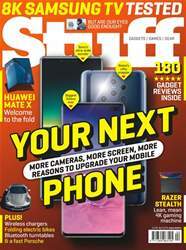 Plus, you don’t even need to buy a new phone if you win our five-star-rated OnePlus 6T on page 29!